Well here you go. A week or so ago I promised (on Instagram) to share this wonderful romaine salad with you (sorry for the teaser) and it kind of feels like a holiday, all this bubbly anticipation in my tummy like something really exciting is about to happen. Salad will do that to you when it’s as amazing as this one. My friend Teri kindly gave me this recipe after she and I made about 3,000 pounds of it for a church Christmas party last month. I can tell you this, there were more rave reviews over this magical salad than any other thing on the menu. Literally, people were rushing into the kitchen after the party wanting to know what was in the magnificent salad and what prompted the change from the usual bowl-of-iceberg-lettuce-with-enormous-bottle-of-ranch-dressing that is normally served at such things (we quickly hid the gigantic, sanitized tub we had used to mix it all up in – you know, keep the magic alive that whipping it up for 400 people wasn’t a big deal at all). 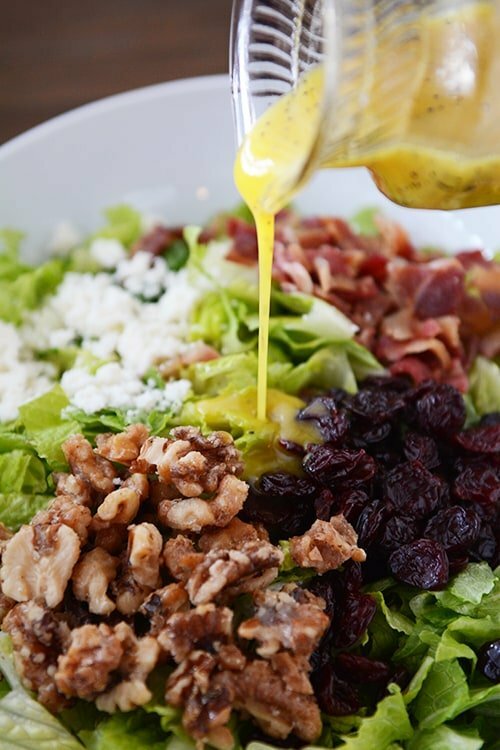 The light vinaigrette (kind of sweet, kind of savory, kind of all things yummy) can be made in advance, along with the candied walnuts, and then it’s just a matter of tossing things together: crisp romaine lettuce, bacon, dried cranberries or cherries, any number of cheeses (feta, bleu, Parmesan) and sweet, crunchy candied nuts. Oh, and just a note about those divine candied nuts? Um, you should probably just go ahead and quadruple that batch because I may or may not be able to testify that they are also divine sprinkled atop yogurt and eaten for a snack at about 2:43 p.m. every single day. I’ve been keeping all the ingredients in separate containers in the fridge/pantry so I can get this on my plate lickety-split for lunch. Talk about a pick-me-up on your average Tuesday afternoon. 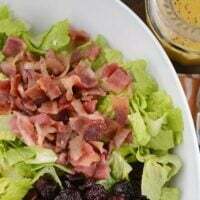 Plus, try adding grilled or rotisserie chicken to this salad for a heartier, main dish option. Heaven. I think I know what that is now. For the dressing, combine all the ingredients except the poppy seeds in a blender and process until combined. Add the poppy seeds and give it another whirl to combine. Pour in a jar and keep in the refrigerator until ready to serve. For the nuts, in a 10-inch skillet, combine the nuts, sugar, butter, salt and cayenne. Heat over medium, stirring constantly with a silicone spatula or wooden spoon until the sugar and butter melts and coats the nuts, 3-5 minutes. Immediately scrape the nuts onto a sheet of parchment and separate carefully into pieces to cool. 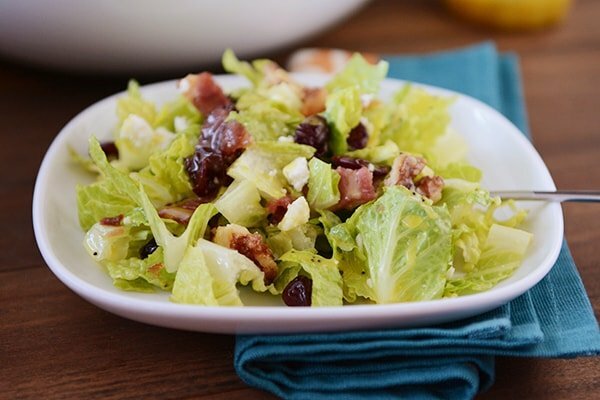 In a large bowl, toss the lettuce, cheese, bacon, dried fruit, and cooled nuts (break them into smaller pieces with a mallet, if needed). Pour a bit of the dressing over the top and toss to combine. Add more dressing, if needed (you may not use it all). Serve immediately. I've also made it deliciously with red wine vinegar and an orange champagne vinegar I spied at Trader Joe's. Hi Mel! Just curious, is it White Vinegar or White Wine Vinegar? Thanks in advance! You can use either but I use white vinegar mostly. I hit a home run with two of your recipes last night…the Feta Dip and this wonderful salad. I forgot the cranberries and it was still delishous! My husband woke up talking about it this morning. I served it with a beef stew and toasty bread..YUM!! I forgot to add….I used Parmesan Reggiano and blue cheese. I think I may make it again tonight. Do you think the poppy seeds add much flavor or could they be left out? They add a nice texture and flavor, but you could definitely leave them out. Hi Mel. Quick question. What’s your favorite cheese to use in this salad? And do you like the dried cranberries or cherries better? I know it’s all personal preference, but you’ve never steered me wrong! Love your recipes. I love either feta cheese or Parmesan (shaved or freshly grated). I almost always use dried cranberries and love them! Is the mustard used dry or the yellow mustard we use for hotdogs? Thanks…. I use yellow prepared mustard (not dry mustard). Hey! I’m wondering where you got your classic salad dressing container?? I love it, I can’t find anything like it. Hey Shalise – a friend of mine gave it to me years ago (it was from her mother or grandmother’s collection0, so unfortunately, I don’t have a good source. Sorry! My question is that the basic formula for oil and vinegar dressings are that the oil is 3 parts to 1 part vinegar. Why is this not the case for this dressing ? Isn’t that the normal ‘rule’ ? please msg me asap ! I don’t think there’s official rules for salad dressing, at least not that I know of. I love the dressing in this recipe as written! A couple of weeks so you were kind enough to point me toward this recipe for a bbq we were having. The party was last night and I took your advice and made this salad so I just wanted to thank you for the suggestion and let you know that the salad went over very well. All the food was amazing and this salad held it’s own. I will most definitely be making this one again in the future. Thanks so much! I’m not sure if I be commented on this yet or not, but it doesn’t hurt to again! This is an amazing salad! I love to mix the romaine with a cabbage kale mix I can get at Costco. I have made this for the last 3 weeks consistently for lunch for both the hubby and I. It is absolutely delicious! 5 stars! Yum! Love the dressing. Didn’t have poppy seeds on hand and still tastes great. I have made this several times. My family fights over it. I recently made it for a brunch and the hostess who is hard to impress, raved about it. Thanks, Mel!!! This is my kids (13 and 10) favorite salad. It’s fun to see my otherwise light salad eaters load their plates with salad every time I make this. This is an AMAZING salad!!!! It’s also yummy with trader joes dried orange flavored cranberries!!! Thanks again for your amazing recipes!!!!! I to did this for a church dinner with the same results! Since then, I have made this salad with some minor changes at least once every two weeks. The dressing stays in the fridge at all times. My husband wants it on every salad! And the nuts! Sometimes I just make them as an appetizer. Bless you for posting this Amazing salad. Here are my minor changes: Use walnut oil and Dijon mustard. Truly enjoy your website and go to it almost daily. You have made me a better cook! I made this to go with your Shepherd’s Pie, as per your suggested beneath the recipe, and it was the right decision. I did leave out the bacon for time reasons, but the salad was delicious and right combination of everything a salad should be. Hi Mel! I’m making this for a family reunion, but we’re flying and I’ll be making it in a rental house, so I’d have to buy every single ingredient for the dressing. That’s too expensive for just one salad, and I don’t want all those ingredients leftover. 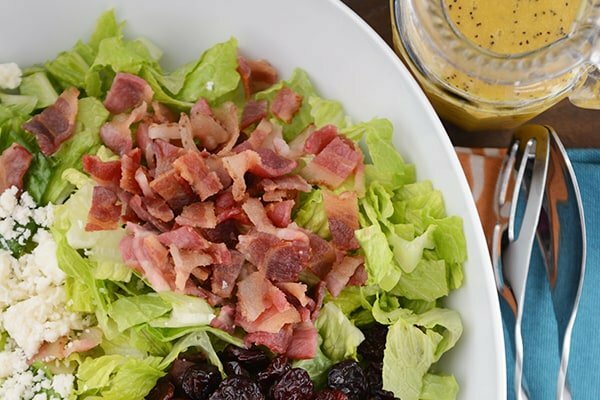 Do you have a store-bought dressing brand you’d recommend for this salad? I’m sad about the store-bought dressing, but it’s just more practical! Thank you! I totally hear you, Glindy; the storebought dressing is probably the best idea. Unfortunately, I’m not sure what to recommend. My favorite dressings are the refrigerated (like Litehouse brand) and maybe they’d have a good sub? Something creamy or vinegary with poppy seeds? Good luck! Do you happen to still have quantities of each item needed to make this for 400? I was just put in charge of our stake rs luncheon and I have no idea what I’m doing!! The only thing in my corner is that I have your recipes to aid me!! Did you use a Rubbermaid bin to mix it all? how many bins dud it take? Ah, this conversation is bringing back great memories. My friend Teri was in charge of the salad. Let me check with her and see what she has to say. Yes, she did mix it in a rubbermaid bin (just one bin in several batches portioned out in large bowls). Thank you! Thank you!! I literally could not sleep last night tossing and turning worried about having to figure out a meal for 400. I must channel my inner Mel!! We eat Mel recipes a few times a week for sure!!! Hi Janet! I was Mel’s partner in crime for the Great Salad Event. The keys to making this for a large crowd is to prep what you can ahead of time and mix at the last possible second. Here is what I suggest. First, make a single batch of the recipe as Mel gives it. Decide if: 1) you are ok committing to the candied walnuts? – it’s a 2-3 hr job to make that many ahead 2) how many do you feel the recipe will serve (especially the dressing)? and 3) do you like it and do you think others will like it? If after that you want to go for it, just do the math to get to the number of servings you need. A couple other tips: 3 servings per head of romain is just about right. Use pre made bacon bits in a bag – I believe we used 2 of the big bags from Costco. Walnuts are expensive – buy bits and pieces in bulk but cook them in small batches. In my experience, the dressing goes a lot farther than you think but it’s cheap so don’t worry about it. I made 2 batches at a time in pint size mason jars which were also handy for transporting and remixing. When we arrived at the event, I had the bacon, walnuts and dressing prepped. We chopped the lettuce there – this took 3 people about an hour, I think. I don’t think we added cheese, mostly due to the budget. If you do add cheese, I would suggest Swiss for a crowd. We used a giant Rubbermaid bucket, clean of course, to mix at the last possible second so the romain wouldn’t wilt. We probably did it in thirds. We just dumped in the lettuce, then some dressing, then the toppings. It was not scientific or mathematically accurate. For a luncheon, you could add chicken and make it a main dish. Thanks for this! I am about to make this salad for 200 people for the ward Christmas party. This is very helpful!! This was so delicious! Love, love, love! I used Truvia for the dressing, added grilled chicken, and used plain pecans. It was so yummy! Thank you for sharing! Will definitely make again! This looks yum! Tips for making this for a large group like you did? Did you use pre-cooked bacon crumbles? Looking to add this to our RS Dinner menu. Thanks for all your superb recipes and tutorials. Big fan! Yes! We used the bacon crumbles in the bag (from Costco). This has probably been mentioned already, but swap out the yellow mustard for Dijon mustard & use honey instead of sugar. YUM! Also, instead of vinegar could use fresh orange juice, it’s SO GOOD. 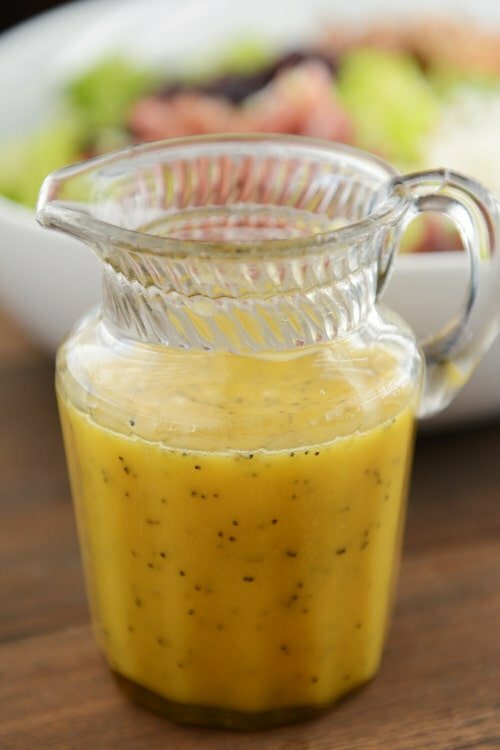 Citrus honey mustard dressing: it’s good on any salad! Absolutely delicious!!!! The dressing is out of this world!!! I made this for dinner tonight (along with your whole wheat rolls, and your oatmeal peanut butter chocolate chip bars for dessert! ), and I LOVED it!! My husband did, too! The combination of ingredients was fantastic, and I like the dressing! I have a normal poppy seed dressing I use, but I like the more mustardey taste in this one. Thanks! WOWZA! I made this today for a friend who came over for lunch and it was so yummy. I made it with an entire package of pre-washed hearts of romaine. My friend and I each had a bowl for lunch. Then after she left, I stood at the counter and ate the entire rest of the salad. Didn’t even bother putting it into a small bowl first, just ate it right out of the wooden salad serving bowl. It is that good. Thanks for your awesome recipe! Love your site! Yummmm! Another fabulous recipe! We had this for dinner tonight and so enjoyed it! I wasn’t sure how the yellow mustard was going to taste but it all worked! We added grilled chicken and a dinner roll…just perfect! This is truly calling my name! I LOVE salad! Made this salad for dinner last night and both my husband and I LOVED it. Sooooo yummy that I stopped at the store to get more ingredients to make a big batch to keep on hand for the week’s lunches. Thanks for all your wonderful recipes! I know what’s for lunch today! I have never added cayenne to my candied nuts, I’m excited to try it. Sure, this salad is really adaptable, you might try adding crunch with croutons or toasted sunflower seeds. This looked so good to me! Funny, but I “crave” cool salads more in the winter than in summer. I used this recipe as inspiration…I normally keep green and red cabbage for salads as I live rurally and the cabbages last a week or more. Shortening my story…I used a mix of finely shredded red and green cabbage. I used walnuts, but didn’t candy them as I do NOT need the sugar even though they sound wonderful. I had just crumbled and fried some spicy sausage so used in place of the bacon. Had real Greek Feta as well s dried cherries! AND, I made the dressing exactly per the recipe. No not exactly per the recipe but a close-ish match and it was wonderful. Mel, I look at your weekly menu plan always and have discovered so many things from before I found your blog. The skillet taco pie is on my list for tomorrow or Thursday! Hi Liz – your variation on the salad sounds fabulous! Thanks for letting me know you use the menu in the footer. I was tempted to stop updating it but if even one or two people look at the weekly updates, it’s worth it. Thank you! YES! If it is not too much trouble, I love looking at the menu and have found things nearly every week that I’ve saved or made. Mel, long time follower here and I don’t think I’ve ever commented. For some reason I can’t get these nuts candied right. I’ve done slivered almonds in the past where you melt the sugar and butter first ans then at a certain point you add the nuts. Thought this recipe sounded much easier(and I’m sure it is!) but the sugar and better aren’t really melting persay but crystallizing and not coating the nuts is that how it’s supposed to be? Mine is Just small chunks of hard sugar and nuts! Making salad for the sister missionaries tonight! Thanks Mel! Do you think you might be using too high of heat to start with, Karen? Try putting the sugar and butter in the skillet first then dumping the nuts on top. As it heats up (without stirring), the butter and sugar should melt and then you can start stirring it all together. I had the very same problem (Karen above) – thanks for the suggestion. I made this salad yesterday for my son’s birthday dinner – wonderful! I know the previous comments are older but I had the same problem. To me it seemed as if there was too much sugar or not enough heat. I’ll give it another try. Thanks for your blog! Hi was wondering if you could use honey instead of sugar? Thanks for all the amazing recipes – you are my go to for all things concerning food! Definitely worth a try although I haven’t experimented with honey myself yet. I make a honey-mustard vinaigrette that is not too far off from this poppy seed vinaigrette so think honey will work here. I find it takes bit more mixing depending on how runny your honey is. I sometimes add a wee bit of sugar in my honey-mustard v as it seems to help all combine. Just wanted to let you know that I fixed this salad for lunch yesterday, my supper last night AND my breakfast this morning 🙂 it’s delicious!!!! A winner in my book! This salad looks delightful- I cannot wait to give this a try! I just came across your blog and really enjoy it- I look forward to reading more. Cheers! I made this for dinner and it was delicious! We especially loved the dressing. Unfortunately I have a nut allergy, so I made candied pretzels instead. I have no idea if they taste like candied nuts, but they were yummy. And I added red onion. Do you think you could make the dressing with maple syrup instead of sugar? Sounds like a yummy alternative – I like maple and mustard together so I’d say it’s worth a try! This looks great, can’t wait to try it. Question though… I’ve just started making my own salad dressings, and the oil-based ones all turn solid in the fridge. Which on the one hand makes sense, but on the other hand – it doesn’t happen to store bought ones, and I’ve never heard a home cook talk about it… So my question is, am I doing something wrong? 🙂 I’ve been using veg oil or EVOO, is that wrong? Do you just nuke it before you use it? Thanks!! Just let them sit out for a short while before you want to use it and it will be fine. I’ve been making my own dressings for over 30 years and always get raves. You can use either veg. or Olive oil. I simetimes use a combo. Check out other oils, like grapeseed or walnut. etc. Hey Kristen – I think it also depends on what else is in the dressings. I’ve had some olive oil based dressings that stay liquid in the fridge and others that get thicker. I usually put it in the microwave for 5-10 seconds (it doesn’t warm it up, just loosens up the oil a bit). This dressing for the recipe I posted today hasn’t ever thickened up in the fridge when I’ve made it – I’ve used both avocado oil and olive oil so hopefully you’ll experience the same if you make it. Sounds so simple and yummy. Can’t wait to try it! I have a slightly similar recipe that uses a raspberry vinaigrette and a few different vegetables. Made this for lunch and even the kids loved it! Than you! I am adding this one to my menu for the week, also interested in the questions on the mustard so will be following up. I am excited to try this! Just a quick question… Should the mustard be dry mustard or just out of the bottle, like French’s? This salad is making me drool!! I use yellow mustard (the refrigerated kind in the yellow plastic bottles). Haha! That made me laugh, Susan! Tell your son thanks – made my day! Would dijon mustard work for the dressing? I don’t normally keep yellow mustard, but there is big difference between yellow and dijon. Thanks!! I think it’s all about the flavors you like. The yellow mustard is more mild than Dijon but I think if you love the Dijon mustard taste, it’s definitely worth a try. Love that you tried it so quickly, Rachel! Yum! That is one lucky Ward Christmas party to have this!!! Thanks! I can’t eat walnuts. They do funny things to my mouth. The dressing looks divine! How ironic, I was just at GNC looking at a bottle of avocado oil thinking, what in the world would I do with it. Ta da!! Can’t wait to try it! Crasin make every salad better, they’re Magic yummy salad boosters. Thanks Mel! On the menu it goes. 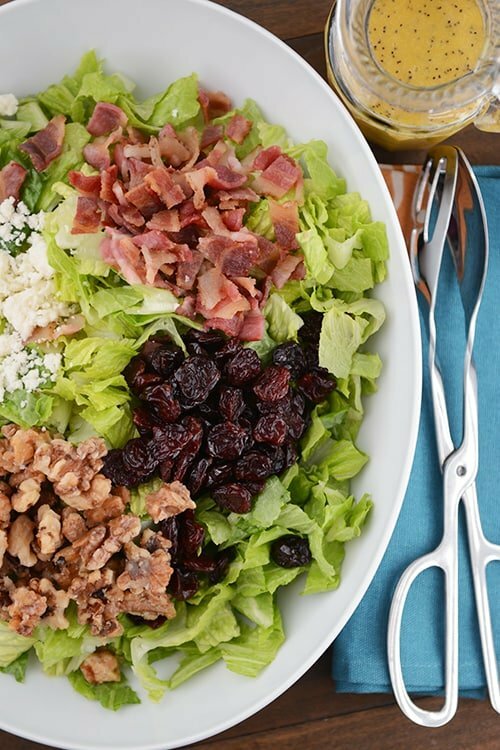 Ooh… this salad sounds amazing with the candied nuts, cherries, and popyseed dressing.. yum! Have printed out to add to my menu plan for the week! This looks divine. I love good homemade dressing and I LOVE candied walnuts. I just wish my boys would consider a salad ok to eat as a meal. I love nuts and bacon in salads. I can’t wait to try this! This looks and sound delicious. I can’t even imagine making, let alone planning a salad for that many people. Wow…this is my kind of salad. It has all of my favorite things in a salad- dried berries, candied nuts, cheese and bacon! I have everything to make this except the poppy seeds. Since it’s snowing here today and tomorrow, I will have to make it without the poppy seeds until I can get to the store. I agree Kim in MD 🙂 giggled also! Hope you had lots of help with the 400 peeps. Takes me back to youth group & making potato salad! <3 your website, Mel! Ok…so I could not pin this fast enough! lol I just discovered your site this weekend and LOVE it! This looks delicious!!! I know what I am serving for supper tonight 🙂 can’t wait to try it!! !